Luxury lifestyle communities for the over-50s has exploded over the past few years, with many developers taking the opportunity to change the face of the retirement sector. 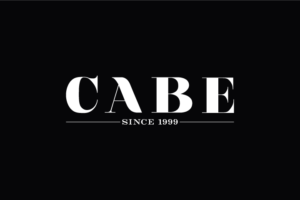 CABE is one developer that has expanded its range of residential projects by releasing a premium Sydney collection of apartment homes, exclusively for the over 5os market. Watersedge is positioned on the coveted Pittwater’s foreshore in the Sydney suburb of Bayview on Sydney’s Northern Beaches. CABE Managing Director, Lou Zivanovic said the launch of Watersedge at Bayview is a unique offering for the over 50s market which traditionally comprises of higher density projects. CABE’s Watersedge at Baysview[/caption]“Making the decision to downsize doesn’t mean that buyers have to compromise on size and design. Watersedge is an opportunity to secure a beautifully appointed apartment home that still offers spacious living and entertaining areas, as well as a design that speaks ‘luxury’ and ‘high-end,” Mr Zivanovic said. Far from a retirement home in a traditional sense, Watersedge at Bayview is designed to set new benchmarks in over 50s living. Designed by the renowned Lesiuk Architects, the project has been created to offer high-end luxury with an eco-friendly design sensibility and a focus on low-maintenance living. CABE’s Watersedge by Baysview[/caption]Developer Halcyon is another developer set on capturing the over 50s market with their Vision community on Queensland’s Hope Island and Halcyon Glades at Caboolture. Vision by Halcyon[/caption]The $60 million Vision development comprises 88 homes with Halycon joint managing director Bevan Geissmann has responded to the baby boomers’ desire to downsize their financial commitments while upsizing their lifestyles. “Our communities are tailored to maximise lifestyle while offering no exit fees and the opportunity to secure solid capital gains,” he said. Designed by DC8Studio, Director Riccardo Rizzalli said there was a focus on ‘retreading’ rather than ‘retiring’. “Our approach goes beyond the design of the dwelling and integrates it with the design of the community realm to create a stronger and more cohesive design outcome,” Mr Rizzalli said. “We brought this approach to both projects and made modifications to the masterplans that created designs that will grow with the community and help create a truly better place to live.”Dr Geissmann said, “Today’s baby boomers have high expectations for their retirement lifestyle, so location and design of the home are both vitally important. “As a developer of over 50s communities our focus weighs heavily on these aspects. “It’s why we invest a lot of time into researching market trends, finding the right sites, developing masterplans and creating homes that respond to the needs of modern seniors.”Pradella Property Ventures and their award-winning Seachange Village Arundel and Seachange Village Emerald Lakes is another developer that is leading the charge with five-star over 50s living, only recently taking out a UDIA award in seniors living category. 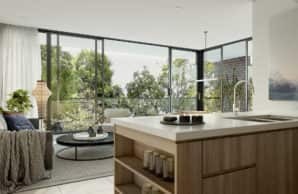 Pradella Property Ventures’ Seachange Village Arundel[/caption]Seachange Village Arundel Project Director Phil Goodman said the developer’s original vision was to create a community that would allow its residents the opportunity to enjoy the best time of their lives. “The Seachange vision was to create a community that would allow them to make it happen,” he said. “We are extremely proud of what we have delivered at Seachange Village Arundel. Not only is the development a unique offering for the over 50s demographic, but the quality of construction and design is outstanding.”Integral to the Seachange Village Arundel lifestyle is the world-class Country Club, just a short walk from any home in the development. Luxury facilities include dining areas, club lounges, games rooms, a library, bowls club, seven championship bowling rinks, 32-seat cinema with tiered seating, craft room, workshop, two floodlit tennis courts, indoor heated pool and outdoor lagoon pool, spa and gym, sauna, steam room, wine room and dance floor. Pradella Property Ventures’ Seachange Village Arundel[/caption]“We are catering to an increasing segment of Australia’s population who demand very specific housing, so recognition from UDIA has provided a strong endorsement of the vision we set out to achieve,” Mr Goodman said. 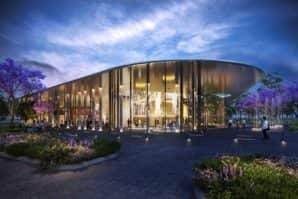 Design details have been unveiled for the Western Sydney Community and Conference Centre which will form part of the Panthers Group’s transformation of the Penrith Panthers precinct. A staged concept proposal prepared by Turner Architects has been lodged with Penrith City Council for a community facility, conference centre, exhibition centre, hotel, retail premises and serviced apartments. The first stage of the proposal provides a community centre, conference facility and new civic domain to deliver “a destination for connecting, engaging, learning and entertainment for the residents of Western Sydney and beyond.” This is supplemented with landscaping and public domain improvements along Ransley Street, Panthers Link and Mulgoa Road and a secured, weather-protected basement carpark. The estimated cost of works is estimated at $30 million. The community centre will be located on an existing car park site and help revitalise the Riverlink Precinct as a key entertainment and recreation destination. A flexible conference facility would be capable of seating up to 1000 people or hosting a number of smaller functions. To the west of the site lies the Panthers Club and I-Fly recreation facility, the ESQ1818 residential development to the north, existing fast food outlets to the south and Panthers training field and stadium across Mulgoa Road to the east. Stage 2 will include a hotel and retail premises at the gateway to the precinct, adjacent to Ransley Street. Stage 3 includes a serviced apartment building with flexible exhibition space to complement the conference centre facility. 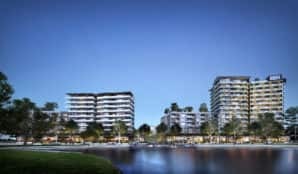 Former Penrith Rugby League player turned property developer Lou Zivanovic received development approval earlier this yearfor the first stage of his $500 million residential development known as ESQ1818. Zivanovic’s flagship company, CABE, submitted the proposal, which will deliver 850 apartments. New Penrith hospital The News South Wales state government has placed spending on infrastructure including health in western Sydney as part of a move designed to fend off criticisms of commitment to fund sporting stadiums. The government has pledged $1 billion to redevelop the existing Nepean Hospital complex in Penrith as part of an “unprecedented” $5 billion investment in Western Sydney hospitals. View the full article here. Western Sydney Business Access, Parramatta, General News CABE has sold more than 60% of Stage One of its $500m East Side Quarter development in Penrith before the official launch. The 6.5ha urban village is adjacent to Penrith Leagues Club and the sales included a record for Penrith when a $950,000 three-bedroom penthouse was bought off the plan.